Elect to hire an attorney to prepare your will if your estate is large, your holdings complex or your heirs litigious. Consider drafting your own will for a simple estate. If you elect the later course, obtain a good form will specially prepared for your jurisdiction. Top choice for a form will is a statutory will, a form will approved by the legislature as valid in your state. Statutory wills appear in the probate code and courts often provide blank copies. Alternatively, search the law library or legal bookstore for a form will approved by the bar association in your state. Consider whom you wish to benefit from your property when you die. Many people put family first, but law imposes few limitations on heirs. Select family, friends, pets or favorite causes as the beneficiaries of your legacy. Decide whether to leave percentage shares of your estate or bequeath specific property. The latter option mandates clear and detailed property descriptions, including identifying numbers for bank accounts, real property and vehicles. Determine whether to condition the bequests -- for example, leaving assets to your spouse if he is alive at the time of your death -- and, if so, identify alternate beneficiaries. Take this information to your attorney or insert it in the form will. If you are filling out the will yourself, the first blanks will ask for your name, date of birth and current residence address. Next, you will insert your bequests -- identifying the beneficiaries by full name and address -- in the appropriate blanks. Name an executor to steer your will through probate, but confirm her willingness to serve before adding her name to the will. Realize that life insurance policies generally pass to beneficiaries you name in the policy, not according to the terms of the will. Certain other accounts -- retirement packages, for example -- can also pass directly to a named heir. Calculate these accounts into your overall estate plan. Most policies allow beneficiary changes, so you can amend if necessary. 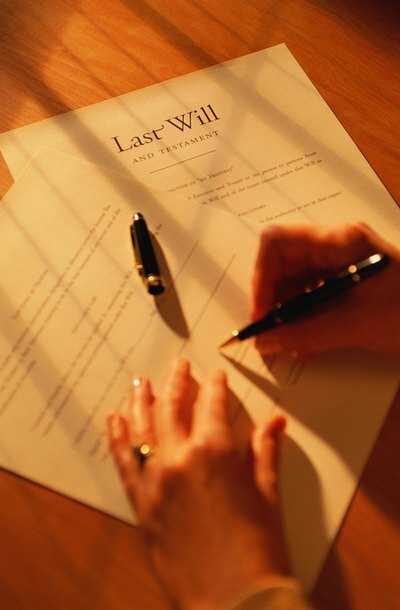 Sign your will using the procedure required by your state's probate code. Your attorney guides you through the process, termed "will execution." For do-it-yourself drafters, a good form will describes how many witnesses your jurisdiction requires and the execution process. All states require that at least two adults watch you sign the will or affirm your earlier signature. Select disinterested witnesses, not otherwise named in your will. Tell them that the document is your last will and testament, then sign in their presence. Each witness signs as well.